This appealing and quirkily designed camera is going to let you keep an eye on your loved ones and property from wherever you are in the world. With this discount, you can head into the festive relaxation period safe in the knowledge that you can bring a level of protection into your life for just $29.99. This camera is basically an all-in-one piece of kit that can be installed in your home or office to keep a 24/7 eye on anything or anyone that is important to you. This equipment should not be confused with any type of home automation camera system that links to Apple’s HomeKit or through other voice systems like Amazon Alexa or Google Assistant. However, that’s why you are going to be paying nowhere near that amount as you bring some surveillance into your home. The basics of this camera equipment include motion detection and real-time alert notifications to ensure that the owner of the camera and the holder of the smartphone gets instantaneous notifications when motion is detected at the property. If something happens in or around the location where the camera is installed, then you are definitely going to know about it. You’re also going to know about it in full high-definition quality thanks to the 1920-by-1080 pixel resolution and 9 built-in infrared LEDs that ensure that best possible quality regardless of the light conditions in the environment. Home-owners are also going to get a little bit of additional control over this camera. 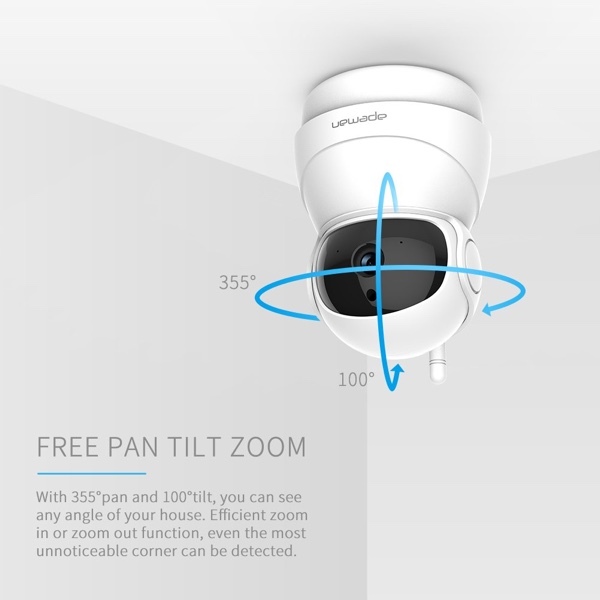 It comes with pan, tilt, and zoom functionality to ensure that any area of coverage can be seen with remote access and it even offers two-way audio. Perfect if you have loved ones at home or if you have pets that need to hear the reassuring tones of a familiar voice. Given the cost of this hardware you could be forgiven for thinking that this is all a pipe dream, but alas, no it’s not. This is very real and your chance to bring remote camera surveillance into your life for just $29.99. Grab it right now from the direct link below.